Colorado and South Dakota activated their state emergency operations centers. South Dakota’s governor closed state offices in 54 counties. The governor of Minnesota said the National Guard was standing by to help stranded motorists. Portions of interstates were closed in Minnesota, South Dakota and Colorado. One person was killed in a crash with a snowplow near the Denver airport. 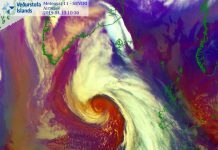 Our latest winter storm–Wesley–is now also a “bomb cyclone,” according to NOAA. 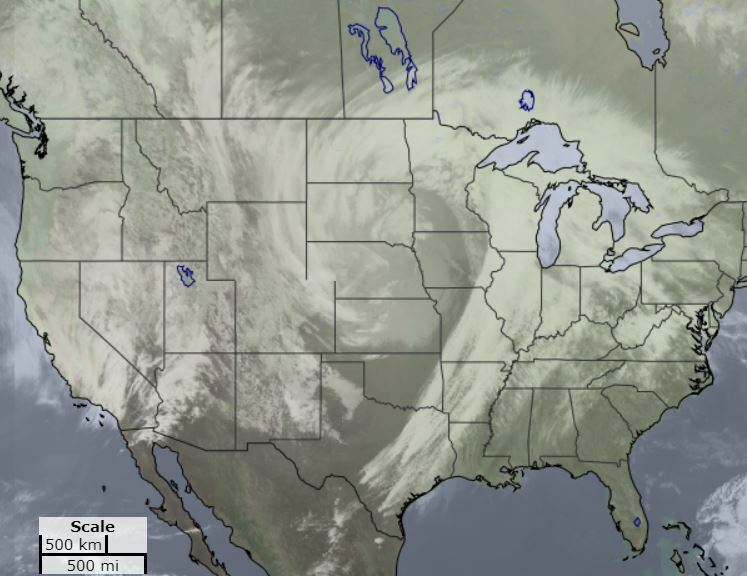 Winter Storm Wesley, the second ‘BOMB CYCLONE’ to hit the USA in less than a month, continued to cause trouble Thursday morning with schools closed or delayed for hours, power outages and hundreds of flight cancellations. There has been a lot of interest in whether the current Wesley storm is a “bomb”. To begin, this isn’t a very important distinction — just because a storm intensifies quickly (which is what a “bomb cyclone” refers to), it doesn’t mean its impacts are worse than other strong cyclones. But yes, it appears that, if considering the adjustment for our latitude, the storm just met the criteria for a “bomb” within Colorado, with the pressure dropping 17-18 millibars in 24 hours, depending on exactly how you defined where the low pressure center was yesterday. The lowest sea-level pressure observed in Colorado was 986.7 mb at Trinidad. The pressure has already decreased further as it has moved into Kansas. The image shows the NOAA WPC’s analysis of the cyclone at noon today. For comparison, the March 13 storm set a new state record low pressure of 970.4 mb at Lamar. South Dakota’s Gov. Kristi Noem ordered that state government offices be closed in 54 counties because of the weather. Ellsworth Air Force Base, 10 miles northeast of Rapid City, was closed to all but essential personnel. More than 89,000 customers were without power in South Dakota, Minnesota, Wisconsin, Michigan and Iowa as of 3 p.m. EDT Thursday. Ice was causing much of the problems in Minnesota. 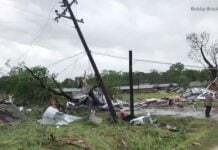 Jackson County in Minnesota reported more than 100 power poles had been knocked down. More than 870 flights in and out of the United States had been canceled by early Thursday afternoon. More than 670 of those were at Denver International and Minneapolis/St. Paul International. Portions of interstates were shut down in Colorado, Minnesota and South Dakota, and more closures were expected as blizzard conditions become more widespread. 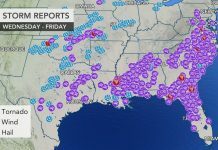 Blizzard warnings extend over 700 miles in six states, from northeastern Colorado to southeastern Wyoming, northwest Kansas, western and central Nebraska, much of South Dakota and southwestern Minnesota. The Denver Police Department reported that one person died about 10 p.m. Wednesday after a crash involving two vehicles near Denver International Airport. A police spokesperson said the crash involved a snowplow from the airport. A trooper’s car was hit when the trooper was working an accident scene. The trooper and the driver of the other vehicle were both taken to a hospital with non-life-threatening injuries. Soldiers at Ft. Carson in Colorado Springs were told to report to work no earlier than 9 a.m. on Thursday. Officials in Colorado and Wyoming had encouraged businesses to close early Wednesday so their employees could get home before the weather worsened. The Colorado Rockies baseball team postponed a Wednesday afternoon game against the Atlanta Braves as conditions continued to worsen in Denver. An evening Major League Soccer game between the Colorado Rapids and the Seattle Sounders was also postponed. On Wednesday, more than 750 flights were canceled at Denver International Airport. Another 200 flights were canceled on Thursday. Airlines, including Delta, United and Frontier, offered travel waivers for customers in the path of the storm. Travelers flying on Wednesday and Thursday can change flights at no charge on some routes. Colorado activated its emergency operations center to deal with any impacts from the storm. 1,800 trained snow-removal personnel and 950 maintenance trucks were standing by. South Dakota also activated its emergency operations center. Several inches of snow had already fallen in parts of the state by late afternoon Wednesday, while a layer of ice covered cars and roads in some areas. Interstate 90 was closed from Rapid City to Sioux Falls remained closed on Thursday, and I-29 was shut down from Sioux Falls to the North Dakota border. Thursday morning, more than 12,000 homes and businesses were without electricity. School was called off for both Wednesday and Thursday in Rapid City and other parts of the state. The Pine Ridge Indian Reservation in South Dakota, one of the poorest areas in the country, is bracing for the winter storm that could bring more flooding. Concerns were also mounting about flooding once all the new-fallen snow starts to melt. As the system moved eastward across the northern and central Rockies and the northern Plains, thundersnow was reported early Wednesday in parts of South Dakota, including in Pierre, the state’s capital city. More than 470 flights into and out of Minneapolis/St. Paul International Airport were canceled as of 3 p.m. Thursday. More than 34,000 homes and businesses had lost power by Thursday afternoon. Minnesota Gov. Tim Walz said “the National Guard stands ready” to rescue any stranded motorists. Multiple crashes along a snowy stretch of Interstate 35 prompted officials to close about 10 miles of the highway temporarily Wednesday evening. RT @MSPPIO: #MSPNumbers Statewide 5:00 a.m. to 12:30 p.m., 04/11/19: 150 crashes (10 with injury, 0 serious/fatal) & 286 veh spin out/off the road & 31 jackknifed semis. The National Weather Service in Minneapolis said up to 23 inches of snow were expected overnight, with a potential layer of ice on top, and winds could gust as high as 50 mph. “Falling and blowing snow with strong winds and poor visibilities are likely. This will lead to whiteout conditions, making travel extremely dangerous. Do not travel,” the weather service warned. 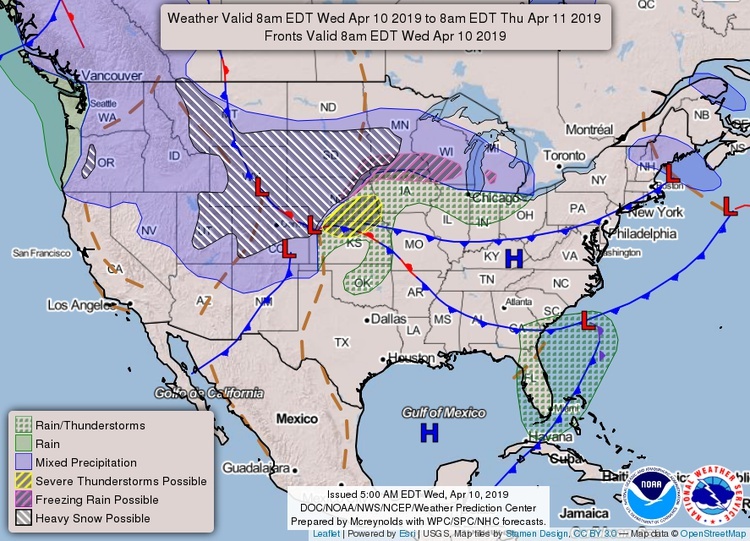 Wesley also impacted efforts to prepare for more normal springtime weather — several states in the storm’s path cancelled tornado drills that were planned for Thursday as part of National Severe Weather Week. Be very prudent on these icy roads. Be prepared for the next round of severe weather! This topic contains 4 replies, has 2 voices, and was last updated by Space Traveler in Alabama 1 week, 3 days ago. Yesterday, in Colorado, it was 80 degree hot summer like day. People were preparing for blizzard. This is crazy to see such a hot air collide with snowy cold air. Of course, we are going to have a huge storm. Julian Assange has been arrested today in London. It is sad to see he suddenly got so old looking with so much stress. Human rights are getting curtailed so much recently. It gets worse and worse.